Under a Brooding Sky along Route 18 in Samyang. By Lee Seong-gwan on March 20. We had 19 walkers depart on Route 21 and 16 of those finished by 1:40 p.m. Photos in a random order. Sunrise was at 6:36 a.m. and sunset will be at 6:46 p.m. There is a high of 9°C with cloud to patchy clear sky in places again. A moderate wind (6-7 m/s) is going to blow south-east. It’s going to be chillier out there so add an extra layer or two of clothing. Taking a Rest on top of the Oreum by No Jeong-yeol on the Route 2 guided walk yesterday. We have THREE walks on the trail. We had 20 walkers take part on Route 2. Photos in a random order. Route 1-1 had 10 walkers. They also cleaned the trail. Sunrise was at 7:01 a.m. and sunset will be at 6:32 p.m.
We have a high of 13°C with cloud and then rain showers mainly from the evening. A moderate wind is going to blow west then south-west. It should be a brooding, but nice walk out there. Breathe easy today as the fine dust disappears. A little micro-fine dust will linger but clear up as the day goes on. 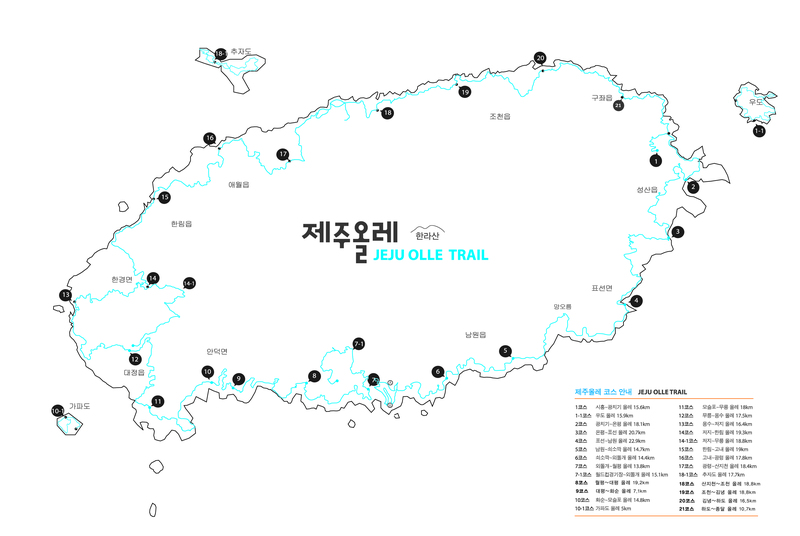 March 1st Movement in association with the Korea Walking Trails Association. Events will be taking place across the country including Jeju. Participants will be setting off from the Route 8 start point at 10 a.m.
Lee seong-gil led walkers on Route 19 from 9:30 a.m. until about 4:00 p.m.
Sunrise was at 7:03 a.m. and sunset will be at 6:30 p.m.
We have a high of 12°C with little cloud to clear sky and a light air (1 m/s – rare for Jeju!) blowing south. The wind will pick up later on in the afternoon. The air quality is not going to be good outside all day. The Western Tip of Jeju Island along Route 12 at Chagwido. Snapped by Lee Seong-gwan back on January 19. There is ONE guided walk on the trail. Lee Seong-gu is on Route 19 with at least 15 pre-registered walkers. We had 25 walkers on Route 6. However, due to flight schedules and returning the mainland, not all could complete the day. Sunrise was at 7:04 a.m. and sunset will be at 6:29 p.m.
We have a high of 12°C with a cloudy morning becoming a clearer sky later on. A gentle breeze (3 – 4 m/s) will blow south. Take some caution with the micro fine dust.